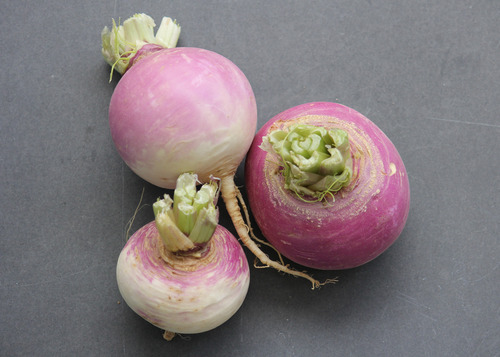 Turnips (Brassica rapa) are among the most commonly grown and widely adapted root crops. Before the potato made its way to Europe, turnips were staple crops for the majority of the population. Turnips were a very important crop, since they could be used to feed livestock as well, allowing a fresh supply of meats throughout the winter. Turnip leaves are usually light green, thin and hairy and the roots of turnips generally have a distinct, and edible, taproot.Turnips are generally available in the fall. Preparation: Good quality turnips will be very firm, smooth skinned and heavy for their size. The coloring will be light purple on the top fading to bright white at the bottom. In general, the smaller the turnip, the sweeter it is. The greens can be cooked as you would spinach. Wash, peel and chop the bulb before using. If the turnips are small, they can be added to salads. Turnips can be boiled, baked, fried or microwaved and served as a vegetable or included in casseroles, or soups. They also make a great addition to meat dishes as they can absorb a lot of fat.